TULSA, Okla. -- With a brilliant come-from-behind drive, Jonas Aleshire scored his second Frankenstein Engine Dynamics Mid-West Pro Mod Series (MWPMS) win of the year Nov. 2, while simultaneously wrapping up the MWPMS championship at the series' 2018 World Finals in Ennis, TX. "We just did what we had to do and kept going rounds and ended up with the championship win and ultimately won the race while doing so, which was a real big bonus," Aleshire said. "It's a really big deal for us, especially after finishing second last year. I really can't thank everyone on our team enough for making this a reality." Before being pressed into service for the 2016 racing season, Aleshire's bright blue Z06 Corvette spent nearly a decade in a customer's showroom after being built by Chris Duncan Race Cars (CDRC) in 2006 at Chandlerville, IL. The car carries a 526 c.i. 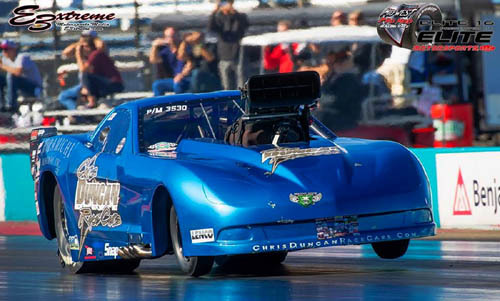 Brad Anderson Hemi prepared by Adam Flamholc at HRE (Hameetman Racing Engines) in Cape Coral, FL, and a CDRC-built Lenco CS2 transmission outfitted with a Neal Chance torque converter. Heading into the MWPMS World Finals (postponed to the Texas Motorplex after being rained out a few weeks earlier in Tulsa, OK), Aleshire trailed Jim Sackuvich and Ron Muenks atop the Pro Mod points list, with fourth-place Aaron Wells also mathematically in contention for the series title. However, when Sackuvich's 2017 Camaro lost ignition at the end of its burnout and the '68 Camaro of Muenks fell to Rickie Smith in round one of racing, the door swung wide open for Aleshire and his screw-blown '06 Corvette to step through. After qualifying 10th on the Motorplex eighth mile, crew chief Duncan tuned Aleshire to a stout 3.68 at 207.30 to beat Eddie Rogers and set low E.T. for the round before turning up the wick to 3.66 and eliminating Wells from the championship scenario in round two. Meanwhile, despite being unable to contest the opening session against Brandon Lewis, Sackuvich remained in the championship hunt thanks to the Mid-West Series' unique second-chance "Slammers" race that continues to pay out a reduced percentage of championship points. It meant Aleshire's semi-final match against Randy Merick--who would go on to win the $50,000 Elite 16 final the next day--would determine the series champion based on three possible outcomes. A win over Merick would secure the title for Aleshire regardless of what Sackuvich managed on the Slammers ladder; a loss to Merick and a loss by Sackuvich still would favor Aleshire; or a loss to Merick and a win by Sackuvich would narrowly tip the championship to Sackuvich. It was all over, then, after Aleshire posted a 3.64 to Merick's 3.66 to cement his first MWPMS championship with one round left in the season-ending event. Official MWPMS results placed Sackuvich as runner-up, Meunks third, and Wells fourth with Todd Martin rounding out the top five in Pro Mod points. 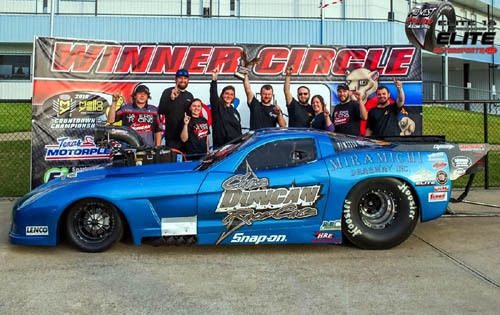 "I couldn't be happier for Jonas and Chris and the entire Chris Duncan Race Cars team for winning the Mid-West Series championship," MWPMS owner, promoter, and 2017 Pro Mod champion Keith Haney stated. "I know what it means to hold this title for a year and I know Jonas is going to be a great representative as our new, reigning Pro Mod world champion." With the season title in the bag it didn't get any easier for the CDRC team, however, as number-one qualifier Jason Hamstra was waiting in the wings after outrunning Wayne Roberts, Martin and Taylor Lastor to reach the final round. "Jason Hamstra is extremely tough," Aleshire said. "When we go up there against him and his guys we're not going to leave anything on the table--and neither are they--but he's an extremely good racer, a good sportsman, so I like racing them." The final pairing was decided on the starting line as Aleshire left with an impressive .029 reaction time before posting a career-best 3.62 elapsed time at 208.84 mph to punctuate his championship in winning fashion. Hamstra was late on the tree before the blown Hemi in his '69 Camaro dropped a valve just past halfway through the run, effectively ending his weekend. "I could definitely tell it was truckin'" Aleshire exclaimed later. "I was a little surprised at how fast we were running, but only because we started the season at 2,650 pounds, then it moved to 2,675 late in the (MWPMS) season, but it was moved again to 2,700 for the finals and Elite 16 race and the car actually weighed 2,710 or 2,715 at the scales each time. So to run that quick at that weight was pretty amazing. "You know, I've been driving this car now for three years and this was by far our biggest weekend together. I couldn't thank Chris enough; he gave me one of the baddest, most consistent race cars to drive, we didn't tear anything up, and it all added up to just a great, consistent weekend. It was just absolutely wonderful."